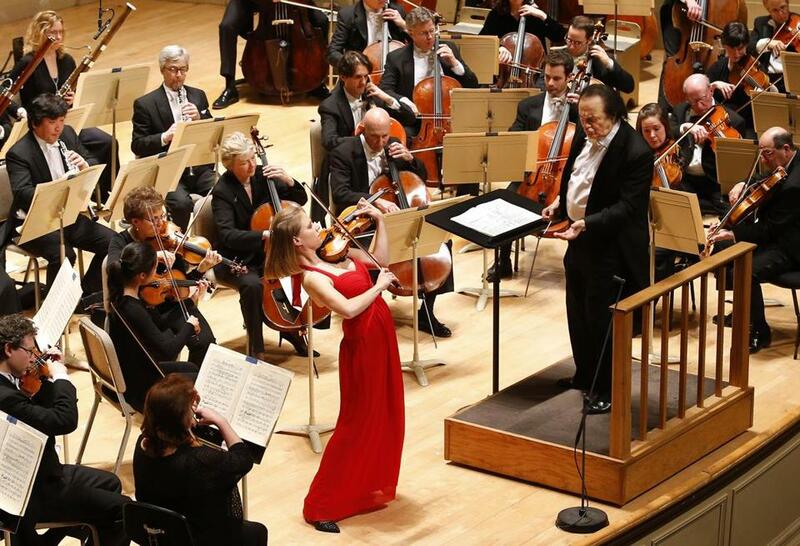 Violinist Julia Fischer and conductor Charles Dutoit performing with the BSO on Thursday. Before then though comes this week’s genial program of works by Stravinsky, Debussy, and Brahms, one that on Thursday offered plenty of distinct rewards, even if it did not quite add up to more than the sum of its parts. First up was a specimen of Stravinsky’s neoclassicism at its most lapidary and elegant: the “Dumbarton Oaks” Concerto, composed in France in 1937-38. The piece takes as its inspiration the Baroque concerto grosso, and Bach’s Third Brandenburg in particular, refracting the form through the angular prism of Stravinsky’s brilliant modern technique. The music is full of dry wit and clipped urbanity, and Thursday’s performance brought across at least a portion of this score’s satisfying rhythmic crunch, the gem-like sparkle of the string and woodwind writing, and the black-licorice flavor of its harmonies. But on this occasion the music also felt a little lost, its immediacy dimmed, by the grandeur of Symphony Hall. The BSO has programmed “Dumbarton Oaks” only three times in its history, and its experience with Debussy’s “Images” is not much more extensive, with this score left untouched since Dutoit himself led a Tanglewood performance of the “Iberia” movement in 1982. The three movements might be described as impressionistic musical postcards, conveying Debussy’s own take on, by turns, the world of English folk music, the sensual atmospheres of Spain, and the exuberance of the French countryside. Dutoit, a veteran Debussian, led an evocative account, with “Iberia” emerging as the most vivid. Recalled to the stage, he yanked up Mark McEwen for a well-deserved solo bow after his contributions on oboe d’amore. Closing the night from another direction altogether was Brahms’s much-loved Violin Concerto, with the German soloist Julia Fischer. There was plenty to appreciate in Fischer’s streamlined and nimble account, dispatched with a technique that is a marvel of precision engineering. As many soloists do, she played the first-movement cadenza by Joseph Joachim (a violinist with no small role in this work’s creation), yet rather than careening through it at top speed, she allowed the music to breathe and admirably conferred on the cadenza a life of its own. That said, the considerable heat and intensity she brought to various passages throughout the work tended to feel applied externally rather than emerging from an organic personal response to the music. For his part, Dutoit led an uncommonly shapely account of the accompaniment. Keisuke Wakao’s oboe solo at the start of the slow movement seemed to cut to the music’s wistful core. Fischer must have liked it, too; presented with a large bouquet afterward, she immediately handed it to Wakao. Responding to a vigorous ovation, Fischer capped the night with an encore: the last movement of Hindemith’s solo Violin Sonata, Op. 11, No. 6.